Mycoplasma contamination has been one of the main problems faced by cell biology research as they affect or change the physiology of the cell. Mycoplasmas frequently occur as contaminants in cell cultures owing to their parasitic properties and ability to conform to host cells. Mycoplasma have no cell wall. For this reason they are insensitive towards antibiotics targeting the bacterial cell wall synthesis (e.g. pen/strep), which are often used in cell culture. The lack of a cell wall in combination with their small size (typically 0.2 - 0.3 ?m) also complicates their detection under conventional microscopes. Their small size and their very flexible form also implies that Mycoplasma can not be removed from liquid media by sterile filtration. Mycoplasmas may long remain undiscovered owing to their lack of macroscopic effects. In routine work with standard antibiotics in particular, mycoplasma contamination by laboratory staff may go undetected for a long time since contamination with other bacteria is selectively suppressed by the addition of antibiotics while the mycoplasmas introduced at the same time can multiply unhindered. Given this, it is hardly surprising that a number of studies have shown mycoplasma contamination levels of up to 40% for cell cultures. A possible reason for these high contamination levels is considered to be the introduction by laboratory staff, serum or trypsin, foreign cell cultures (cross-contamination) or ultimately by the animals from which the cell culture was harvested. Since the presence of contamination can distort the accuracy of results gained from cell cultures or, in the worst case, impair cell growth to such an extent that the whole culture is lost, cell cultures must routinely be checked for mycoplasma contamination. Mycoplasma contamination must be excluded in cell transfection in particular, since the negative effects of the contamination on cell growth and metabolism cause transfection efficiency to fall dramatically. 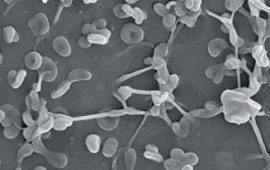 Mycoplasma is one of several genera of bacteria within the class of mollicutes. Mollicutes are minute parasites or commensals of humans, animals and plants; the over 100 recognized species of the genus mycoplasma are by definition restricted to vertebrate hosts, where they are known as pathogens for many diseases (e.g. pneumonia caused by Mycoplasma pneumoniae). Mycoplasma cells are very small and lack a cell wall. Because of this, they are unaffected by antibiotics that target cell wall synthesis. Mycoplasmas have genomes in a size range of 0.58 – 1.38 megabase-pairs with low GC-content (18 – 40 mol%), the smallest of all prokaryotes with the capability of autoreplication. As aerobic or facultative anaerobic organisms, mycoplasmas are ideally aligned to their hosts and thus find optimum growth conditions in cell cultures (37°C) for this reason. Mycoplasmas can proliferate in almost all known cell types and are thus ubiquitous. Roughly 80% of all cell cultures from Japan, 65% from Argentina and 15% from the USA are estimated to be contaminated with mycoplasmas. 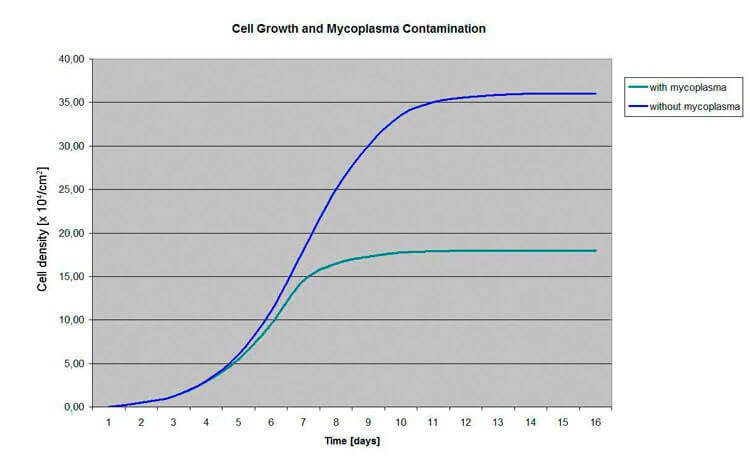 The diagramm shows the extensive effect of mycoplasma contamination on growth of HeLa cells. • Mycoplasmas lodge in the cell membranes and may modulate cell membrane processes such as endocytosis. All these manipulated physiological processes are also involved in the transfection process. 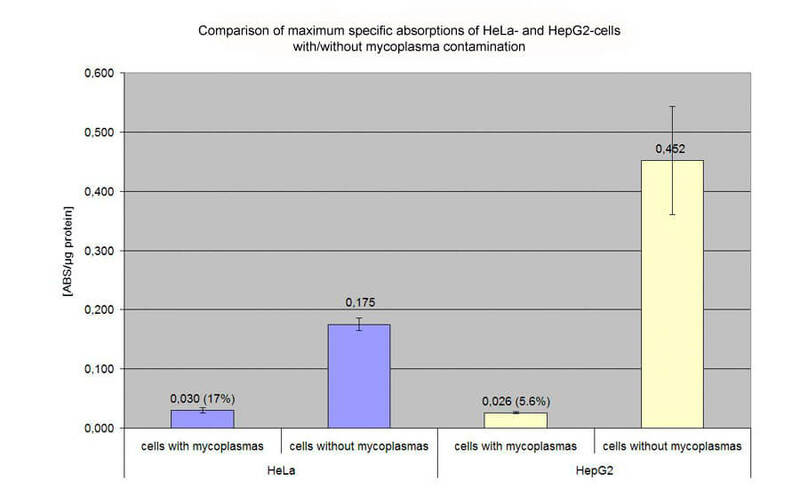 The diagramm shows the extensive effect of mycoplasma contamination on HeLa and HepG2 cells: 17% and 5.6% of efficiency compared to non-contaminated cells. Transfection of HeLa and HepG2 cells with pCMVßgal on 48 well plates. Evaluation of specific absorption values by ONPG- and BCA-assay. The left bars show the highly reduced transfection efficiency caused by mycoplasma contamination. A popular application for the detection of mycoplasmas in cell cultures is to stain cells with DAPI (4',6-Diamidino-2-phenylindol). DAPI intercalates strongly into the minor groove of DNA and shows a relatively broad fluorescence emission at a maximum of 460 nm under UV excitation. In mycoplasma-free cell culture, only cell nuclei are labeled. If mycoplasma cells are present their DNA will be labeled too. Due to their small size, single mycoplasma cells cannot be resolved under fluorescence microscopy: only a high degree of contamination leads to a visible obscure veil formation, which may not be clearly identifiable. A much more sensitive detection method for mycoplasmas is PCR. It is possible to detect mycoplasmas in cell cultures in a very early state of contamination and low concentrations. This detection method is routinely applicable in cell culture work. Although ELISA tests are frequently used for routine detection of mycoplasmas, this method is by no means superior to DAPI tests in sensitivity and specificity. A further method is electron microscopy, which, however, requires advanced equipment and is far more time-consuming. This products achieve excellent results with both established cell lines and primary cells. contamination of these HepG2 cells. cell lines is only given by MycoSPY®. in the case of massive contamination (lane 3). For the treatment of cell cultures contaminated with bacteria often standard antibiotics are used. But antibiotics, which act on the cell wall (such as penicillins) are ineffective regarding Mycoplasma. We therefore offer the product MycoRAZOR®, an antibiotic mixture, which impairs the protein biosynthesis (transcription and translation).